You’ve no doubt seen tons of articles splashed across the Web (over)hyping the hottest investing trends to jump on now. But which promising technologies can we actually tap for payouts and dividends (preferably today)? The “mainstream” list is endless: cryptocurrencies, marijuana stocks—even gene editing (where the white coats actually alter DNA to wipe out diseases like cystic fibrosis). 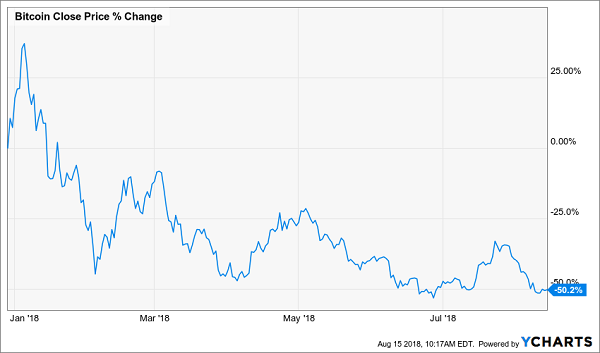 That nasty fall even includes a 19% gain last week after Constellation Brands (STZ) invested $5 billion in Canopy Growth (CGC), the biggest marijuana stock by market cap. And don’t even get me started on Bitcoin! Of course, we know neither of these wagers will put dividend cash in our pockets. That’s why, if you want to profit from huge trends remaking society, you need to zero in on megatrends like exploding energy demand, surging online shopping and retiring baby boomers. Shifts like these will power our price gains and dividends (with yields up to 9.2%, as I’ll show you below)—for decades. If you watch CNBC, you’ve may have heard Mad Money host Jim Cramer preach about the stay-at-home economy, where more folks entertain themselves, shop and order meals from home instead of going out. 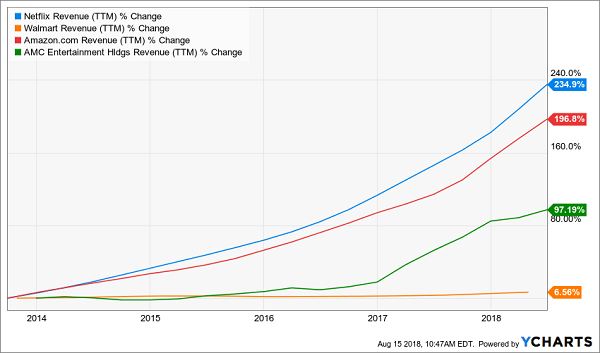 You only need to look at the sales of Netflix (NFLX), in blue below, and Amazon.com (AMZN), in red, over the last five years compared to their brick-and-mortar counterparts, AMC Entertainment Holdings (AMC) and Wal-Mart (WMT). Too bad many of Cramer’s top “stay-at-home” stocks, like Take-Two Interactive Software (TTWO) and ConAgra Brands (CAG)—the latter due to its frozen-food business—pay low (or no) dividends. Heck, CAG even recently cut its payout! That’s far from the case for my favorite way to play this trend. Imagine being Amazon’s landlord—collecting rent as the e-commerce giant spreads across the world … filling your warehouses as it does. Well, imagine no more, because you can start (indirectly) collecting those checks through Duke Realty (DRE), a 46-year-old real estate investment trust (REIT) with 499 warehouses in 20 markets. 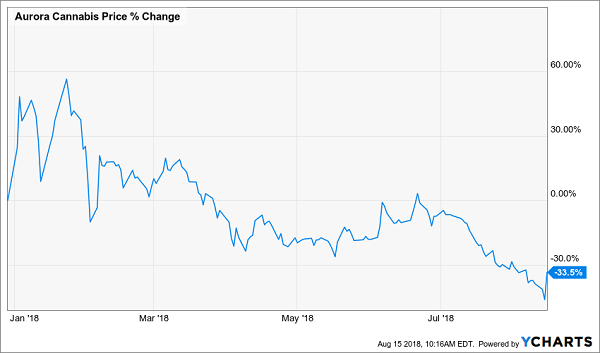 You are only getting a 2.8% dividend yield here, but Duke has been raising the payout in recent years and handed shareholders a nice $0.85 special dividend last December, after unloading its medical-office business. That was a canny move that frees up management to smoke out more opportunities in its core warehouse operation. The payout was the second special dividend in three years—and Duke can do much more, with the regular dividend eating up just 52% of funds from operations (FFO, the REIT equivalent of earnings per share), a very low ratio for a REIT. Finally, Duke trades at 21.7-times the midpoint of management’s just-boosted 2018 FFO forecast. 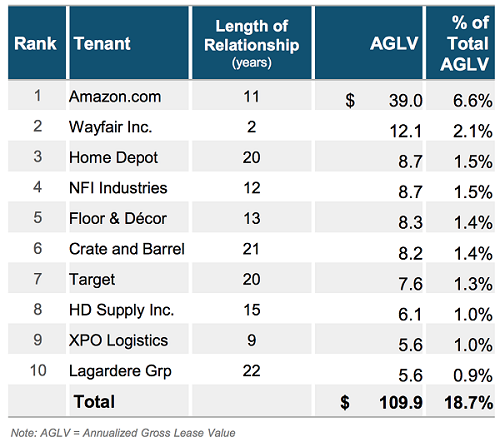 That’s still a decent level for a company that truly is Amazon’s landlord. You won’t find a more direct tie to the online shopping megatrend than that—and it will light up Duke’s share price and dividend for decades to come. No matter what happens with the Affordable Care Act, we can be sure of one thing: healthcare spending will keep spiking higher. There’s no other way for it to go! According to recent numbers from the Centers for Medicaid and Medicare Services, the nation will spend 5.5% more on healthcare every year through 2026. By then, we’ll be dropping $5.6 trillion on it annually. Much of that rise will come from huge increases in costs for Medicare (up 7.4% annually) and Medicaid (up 5.8% a year). I don’t have to tell you who’s driving that increase: boomers, 10,000 of whom are turning 65 every day. Our play to watch on retiring boomers is Physicians Realty Trust (DOC), which has 249 medical-office buildings, almost all of which (96%) are rented out to doctors, hospitals and healthcare systems. One thing I love about DOC is its long tenant list, with no one client chipping in more than 6% of annualized base rent. That means the REIT avoids getting stuck with a big, trouble-prone tenant, a problem that’s beggared healthcare REITs in the past. Here’s another plus: its tenants specialize in the services elderly folks need most, like orthopedic surgery and oncology, so you can bet its buildings will stay full. Which brings me to the trust’s dividend, which clocks in at a gaudy 5.5%. And before you ask, yes, that payout is safe, accounting for a manageable (especially for a well-run REIT like DOC) 86% of FFO. The real kicker is that you can buy in at just 16-times FFO. That’s a smoking deal, given DOC’s top-notch portfolio, price upside from the “gray wave” that’s surging our way, and it’s superb 5.5% dividend. The strong global economy is goosing energy use, with demand rising 2.1% last year, doubling 2016’s rate, according to the International Energy Association. All sources of power saw higher demand: coal, natural gas, oil and renewables. And that trend will continue: the US Energy Information Administration sees global energy demand spiking 28% by 2040. Our play here is the Duff & Phelps Global Utility Fund (DPG), a closed-end fund (CEF) that owns major US utilities like NextEra Energy (NEE) and Enterprise Products Partners (EPD), along with big global names like French electric utility ENGIE (ENGI) and Canadian telecom BCE (BCE). Two numbers stick out here. The first is DPG’s outsized 9.2% dividend, which is as consistent as they come. The other? DPG trades at a ridiculous 10.1% discount to net asset value (NAV). That’s another way of saying that its market price is lagging the value of its portfolio by 10.1%. And since this fund has traded at narrower discounts (and even premiums) in the past, we can expect price upside as that markdown narrows. But even if it stays where it is, you’re still getting 9.2% every year in cash. That discount also helps steady the dividend. Because while DPG’s yield on market price is 9.2%, its yield on NAV is 8.2%, a figure that’s easier for management to cover with investment returns. Finally, while I’d never go as far as to say recessions are a thing of the past, as my colleague Michael Foster recently reported, US economic numbers are sparkling. And I’m betting we’ve got plenty of room to run. The economy grew 4.1% in the second quarter, the fastest since 2014. The unemployment rate fell to 3.9%, near 18-year lows. According to FactSet, 73% of S&P 500 companies are reporting second-quarter sales that top analysts’ expectations. So we’re going to bet on the roaring economy with a fund that gives us “one-click” exposure to the picks of one Warren E. Buffett. shows up in the stock portfolio of Berkshire Hathaway (BRK.A), which is riddled with US success stories like Apple (AAPL), Costco Wholesale (COST) and Johnson & Johnson (JNJ). And thanks to a CEF called the Boulder Growth & Income Fund (BIF), you can get access to Berkshire itself and Buffett’s top picks, while pocketing a 3.7% dividend—more than twice the payout on the average S&P 500 stock. 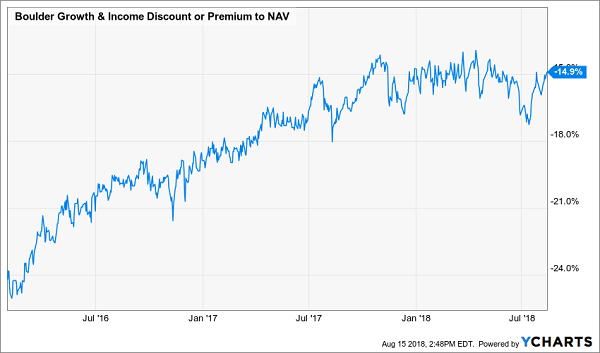 The best part: BIF is far cheaper than it should be, trading at a 15% discount to NAV, which basically means you can buy every dollar of the shares BIF holds for 85 cents. As with DPG, that markdown builds in price upside as it erodes away, as it’s been steadily doing for more than two years. That narrowing markdown has helped BIF crush the market as a whole. 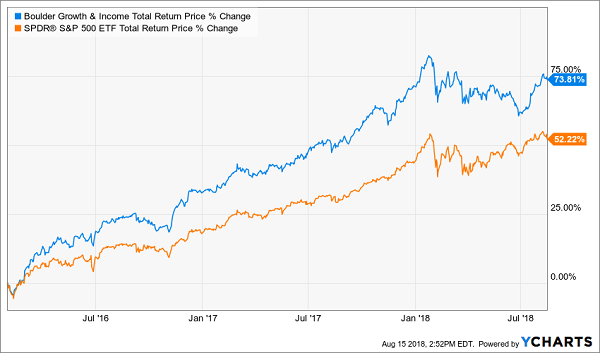 I expect BIF’s discount to keep narrowing (and its outperformance to continue) as the US economy rolls on and more folks realize how easy it is to double their dividends by swapping their miserly blue chips for this Buffett-friendly fund. That means your buy window is still open—but it may not be for long. As I showed you above, REITs and CEFs are the solution to your income worries if you feel trapped “grinding out” dividend income with the pathetic sub-2% payouts paid by your typical stock. 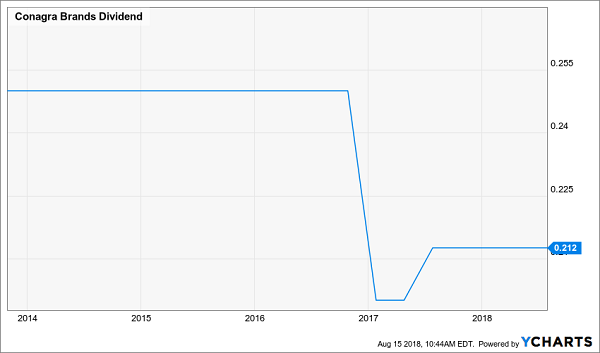 And the great thing—as you can see with BIF and DPG—is that you can often make the switch to these cash-rich dividend buys without actually switching investments! I’ve hand-picked these 6 dividend powerhouses to give you a steady $40,000 a year in income on a $500k nest egg! That’s an 8% average yield—and it’s why I call this my “8% No-Withdrawal Portfolio.” I can’t wait to show it to you. 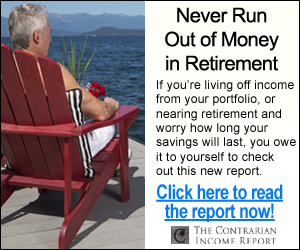 Because I just released a NEW issue of my Contrarian Income Report newsletter, with fresh updates on the 19 stocks and funds in our service’s portfolio, which hands our savvy CIR members massive yields up to 10.4%! 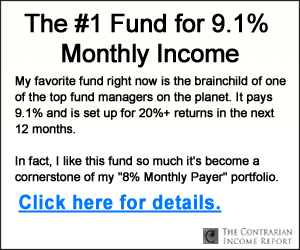 Your next step is simple: Go right here and I’ll give you INSTANT access to my 8% No-Withdrawal portfolio and the latest issue of Contrarian Income Report, with its 19 powerhouse income plays (yields up to 10.4%). Don’t miss out.